The client had a requirement to manually hand-ball goods from vehicles onto pallets which are then in turn off-loaded to ground level by FLT. 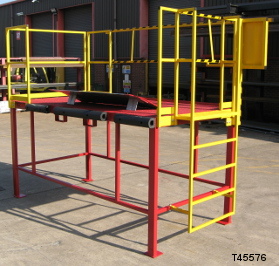 The client visited our works in Chesterfield and had the platform designed using our Solidworks CAD package whilst they were on site. This allowed them to view all areas of the platform in detail and determine what modifications were required. The platform needed to be lightweight so that it could be moved using a forklift truck. Special features: Anti-slip grit coating, safety barrier with locking gas spring, dockplate to bridge gap between vehicle and platform.